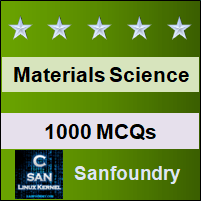 This set of Materials Science Multiple Choice Questions & Answers (MCQs) focuses on “Non-steady State Diffusion”. 1. Which of the following law is used to non-steady state diffusion? Explanation: Fick’s second law is used to obtain the diffusion coefficient. Bragg’s law is used in diffraction of light while Charles’s law is used in thermodynamics and is also known as the law of volumes. 2. Which of the following will diffuse the fastest in iron? Explanation: Hydrogen due to its small size will diffuse the fastest in iron. Carbon also diffuses fast in iron which can be observed in carburizing of steel. 3. Which of the following law is a partial differential equation? Explanation: Fick’s second law is a partial differential law as it is defined as: On the right-hand side we have a partial differential of concentration with respect to time while on the left we have the product of diffusion constant and double partial differential of concentration with respect to the position in space. 4. Which of the following operator is used and on which side of Fick’s second law’s equation? Explanation: Laplacian operator whose symbol is Δ = ∇2, is used on the right side of the equation of Fick’s law. It replaces the double partial derivative of concentration with respect to space. 5. What is the dimension of d2c/dx2? Explanation: The numerator has the dimension of cm-3 and the denominator has a dimension of cm2. Therefore, the quantity has a dimension of cm-3/cm2 which gives us cm-5 as the dimension. 6. Concentration gradient varies with time for which of the following processes? Explanation: The concentration gradient varies with time for non-steady state diffusion. Meanwhile, it remains constant for steady state diffusion. 7. In non-steady diffusion, a type of atom accumulates or depletes from a region. Explanation: As the concentration gradient does not constant with respect to time. So the atoms get accumulated or depleted from certain regions from the system. 8. Gaussian error function in denoted as ef. Explanation: Gaussian error function is denoted by the erf and its corresponding values can be found from standard mathematical tables. It is used to find the solution of Fick’s second law.